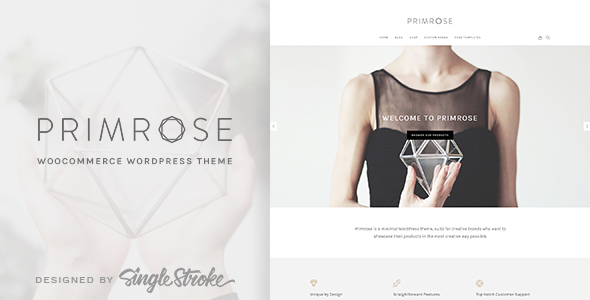 Primrose is a minimal responsive WordPress theme built to take your eCommerce business to the next level. Using the simple drag & drop page builder, tons of options, and WooCommerce integration, you are able to create your online shop that runs smooth and fast on any devices. You can use Primrose to build any kind of online shop like handmade product, fashion, clothing, furniture, jewelry, accessories or any other. What makes Primrose the best minimal WooCommerce theme! Build even faster with our demo data as your starting point. Import — customize — add products — launch! Present your product in more creative ways with various sections and elements to increase sales conversion. Built using SEO best practices, Primrose is SEO friendly and ready for advanced SEO optimizations using 3rd party plugins like Yoast SEO. Words cannot describe how much I love this theme (great work, guys!) It’s everything I wanted – clean design & code, simple to install & mod. It’s very well documented and written in a way that’s easy to understand. I was so frustrated with another theme I bought off Themeforest – it wasn’t as mobile friendly as advertised, was difficult to edit, and there was so much bloat – too many plugins, scripts, etc. Basically a lot of stuff I needed to fix & clean up which delayed so much progress with the store and was a sad use of our money. I am so glad I came across your theme & took a chance with you guys. Your work is a dream. I’ll be keeping an eye on any future products you guys come up with. Design quality, Customizability, Feature Availability, Flexibility and an oustanding Costumor Support. Really! Thanks for checking out Primrose!